Marxism and High Finance are different aspects of the same animal. Ch. 10 of Politische Fibel by Hansjoerg Maennel, 16th (1940) edition. Translated by Hadding Scott, 2011. Marxism stands for Democracy, the International, Pacifism, and the Class Struggle with the goal of the abolition of private ownership. The founder of this doctrine was Karl Marx (real name Mardochei*; 1818—1883). Marx was a Jew; this fact in itself explains the entire manner and thrust of his thinking. He was no "proletarian," but came from bourgeois Jewish circumstances. Marx was also no workers’ leader [Arbeiterfuehrer] but a typical literatus. He drew not from life, but from books. The liberal-capitalist writings of the English national economists [Volkswirtschaftler] strongly influenced him. His chief work is Das Kapital. It is teeming with unusual foreign words; a factory worker for example cannot understand it at all. There are no greater opposites than Karl Marx and Adolf Hitler. Marxism incorporates in their acutest form all the fallacies of the 19th Century that plunged our folk into misery. The Marxists proclaim the International, they deny the value of folkdom, and want to replace it with "international solidarity." The Marxists were pacifists; they have always appealed to cowardice and conducted or glorified treason. Marxism openly called for the class struggle. The Marxists advocated democracy and parliamentarism; their biggest party called itself "Social-Democratic." We have dealt with these views already. We have recognized that these principles are completely to be rejected, because they consistently bring about the collapse of a nation. From the spirit of this pernicious fallacy Karl Marx constructed an economic theory. It would be amiss if we critically examined all the elements of Marxism. With that one could at best awaken the memory of this destructive way of thinking. In a few years the Marxist poison instead should be completely extirpated, so that no German knows at all anymore what Marxism is. Therefore only the crucial point of Marxism should be extracted here. Marx asserts: every entrepreneur always exploits his workers; no employer ever pays out the full earning. Consequently businesses grow at an ever-increasing rate. Big business absorbs small business. In a necessary process of development it finally reaches the point, according to Marx, that there are only a few big capitalists, who on the other hand are faced with an enormous army of proletarians. On the basis of this prospect Marx does not, however, call for an economic policy that would prevent such a development. Rather he explains with quintessentially Jewish skill at distortion [Verdrehungskraft] that this development in the economy is to be welcomed: it is good that big capital constantly increases; it is good that there are ever more powerful, and accordingly fewer, capitalists. That is, according to Marx, a necessary development, which one cannot and should not prevent but only promote. Then, according to Marxist prophecy, comes the blink of an eye in which the few capitalists are dispossessed ("expropriation of the expropriators"(! ), in other words dispossession of the dispossessors) by the teeming masses. The proletariat is to wait patiently for this moment. This doctrine of the Jew Karl Marx shows the whole fraud of Marxism. Here we discern that the goal of Marxism itself is like that of Capitalism: the dominion of World Jewry. We see the same thing when we consider the attitude toward private ownership. Marxism calls for dispossession, for the abolition of private ownership. Everything is to belong to the state. The result is a reward for the stupid and lazy along with a punishment for the efficient, who have achieved something and are now dispossessed, and with that comes a paralysis of productivity, an education for laziness and parasitism. Capitalism on the other hand stands for the inviolability, the "sanctity" of private ownership. It is irrelevant how the capital was derived and how it is utilized. The result is the exploitation of the productive. National-Socialism stands fundamentally on the side of private ownership. What each one creates through honest labor should belong to him. But the state has the right to dispossess when ownership is not used for the wellbeing of the folk or is not honestly gained. Effect of Marxism: everything belongs to one entity, the state, i.e. the Marxist leaders, thus to Jewry. Effect of Capitalism: everything belongs to one entity, the big capitalists, thus also to Jewry. Effect of National-Socialism: to each his due [jedem das Seine]; evaluation according to achievement. Because of Adolf Hitler, the workers have been brought into the folk community, rooted in the soil, and de-proletarianized. Marxism and Capitalism take ownership. National-Socialism makes ownership. Both Marxism and Capitalism have the same Jewish goal and the same Jewish effect. In both, everything belongs to international high finance; all other human beings are propertyless: "proletarians." The practice of Marxism has exposed the entire fraud for the German Worker. The ostensible concern for the proletarian was merely a dramatic performance [Spiegelfechterei] made to fool a great many workers and to rope them into the Jewish-led organizations. Marxism has always taken care that the middle classes and the entire bourgeoisie be ruined [vernichtet] and proletarianized. Thereby the Marxist parties also hoped to gain better prospects for agitation and thus better election results. Social-Democracy and Communism both had the same final aim: they differed only in externals, because of different tactics. Communism is the consistent path of Marxist insanity. Especially in the KPD Lower Humanity organized for the murder of respectable [anstaendigen] Germandom, which joined the SA against the destruction and for the defense of all worthy things. Adolf Hitler: "Everything from robberies, arsons, railroad attacks, assassination attempts, and so on, receives moral sanction in the Communist Idea. The method of individual mass terror alone has, in the course of a few years, cost the National-Socialist movement over 300 dead and ten-thousand injured. In Communist Soviet Russia all foundations of folkdom are being systematically destroyed. Here there is no freedom for the worker or the farmer, no marriage and family, no religion, and no honor anymore. Here Asiatics and Jews are triumphant. Whoever opposes this slavery is crushed with bloody terror. Before the National-Socialist Revolution the Marxist Terror in Germany was manifesting itself ever more clearly. 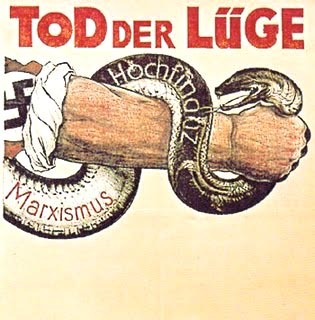 Adolf Hitler had perceived that one could overcome the terror of Marxism not through bourgeois propriety and cowardice, but only through bitter opposition. To this end he founded the SA. The SA has shattered the Marxist Terror. They have accomplished their mission under the heaviest losses. Marxism and Liberalism both have the same root. They are different varieties of the same Jewish Materialistic worldview. Marxism is a Liberalism with reversed early symptoms. Liberalism is the avarice of the "propertied class"; Marxism is the envy of the "unpropertied class." But National-Socialism is the sacrifice of one nation for the nation. Marxism and Capitalism are both instruments of Jewry for the enslavement of peoples. Adolf Hitler recognized that one could break Jewish power only when one had led the German Worker out of the Marxist organizations. The enormous propaganda campaign of the NSDAP had the goal of enlightening the German people about the deceit of Jewry. Whenever the bourgeois Capitalist parties turned against Marxism, they turned against the working class. But they represented essentially the same materialistic worldview as Marxism itself, only in another variation. Therefore the bourgeoisie was unable to defeat Marxism. No party of class, only a national movement, could accomplish this task. The struggle of National-Socialism against Marxism was never a struggle against the worker, but always about the worker and for the worker. Therefore our leader fought above all against the Marxist plague. This struggle has ended victoriously. The National-Socialist Revolution destroyed Marxism. At the onslaught of the SA this rotten doctrine collapsed like a house of cards. Our leader has, with the destruction and eradication of Marxism, created the prerequisite for the reascent of Germany . Joseph Goebbels: "We do not want to abolish ownership; rather we want to generalize ownership." Adolf Hitler: "On the day when Marxism is smashed in Germany, its fetters are in truth broken forever. For never in our history have we been conquered because of the strength of our opponents, but always only because of our own vices and because of the enemies in our own camp." Adolf Hitler: "The highest aim of the folkish state is thus the maintenance of those fundamental racial elements which, as imparters of culture, bring the beauty and dignity of a higher humanity." See inter alia: Adolf Hitler, Mein Kampf, especially vol. I, chapters 5 and 10; vol. II, chapters 2, 3, 4, & 1o. Otto Bangert, German Revolution. Joseph Goebbels , Revolution of the Germans ; Revolution of the Spirit. Karl Marx’s father, son of a rabbi, had changed the family name from Mordechai to Marx. The spelling Mardochei appears in a few sources, but Mordechai seems much more common, appearing for example in John Spargo’s Karl Marx: His Life and Work (1910).